My eyes are gray. Not the gray of a sullen sky or sea but the unlikely lavender-gray of a nimbus surrounding a winder moon, colors both opaque and translucent at once. Magical moon eyes and hair that changes color? Overwrought, florid prose? No, thank you! But I pressed on, because it was the only book I had with me on my morning commute, and you know what? I’m glad I did. 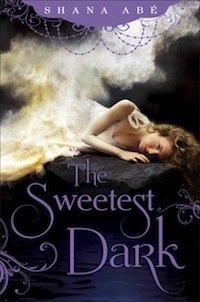 The Sweetest Dark was never going to be the kind of book that really gets my motor running, but there were definitely things about it I liked. That said, there were some major structural problems. In that there was no structure, that is. The plot is all but nonexistent. Lora has no goal or ambition beyond getting through life each day at a time: she falls instantly in love with one of the boys in the book, Jesse, but he falls instantly in love back, so that’s no problem; she decides she wants to master her powers fairly late in the game and gets a handle on them fairly quickly. There is no conflict or antagonist: the Germans and an English duke make trouble towards the very end, but that’s an afterthought, thrown in to provide a climax; some of the girls at school are mean to her but never in a way that winds up being significant to the plot. (More on that later.) There’s never any sense of building urgency, or urgency at all; the vast majority of the book is devoted to describing the setting, Lora’s feelings and dreams, and how gorgeous the two boys are. The prose, while florid, is mostly pretty good, but that can’t carry a nonexistent story. On the other hand, I did like Lora herself. Comparisons to Twilight are inevitable in this genre, especially for someone like me, who hasn’t read much in it, and with that opening “oh I am so ugly with my luminescent eyes” I was dreading another Bella. But Lora is far spunkier. She’s not tremendously active as a character – no one is, because there is no action in the book – but her internal narration is pleasingly sassy, she takes no crap from her fellow students or pretty boys, even titled ones, and she cares about things like the war and her fellow countrymen, which is a nice contrast to Bella’s selfish tunnel vision. There’s nothing remarkably standout about Lora, but it’s a lot easier to spend several hundred pages inside her head. And the boys? Well, there’s good boy Jesse, the reliable, flaxen-haired nephew of the caretaker, and bad boy Armand, the dark-haired and pale wastrel younger son of the local duke. I’m not usually a “good boys are boring, bad boys are interesting” kind of gal, but I hated Jesse. He literally has no personality beyond “hot and in love with Lora and has magic powers.” He is so disinterested in the not-Lora parts of the world that everyone literally thinks he’s mute; it’s explicitly stated that he escaped the draft because he’s “simple.” I just can’t get behind a draft dodger who’s only dodging the draft because he’s too disdainful of normal people to speak to them. It doesn’t help that when he explains to Lora that he magically called her to him and she points out that the war brought her to him, he’s completely unconcerned with the fact that the war might be partially thanks to his magic, or the war in general. He is completely devoid of compassion or interest in the world at large. And to make him even more annoying, he’s constantly, pointlessly cryptic, mostly because if he ever gave a straight answer the book would be over, because it has no actual plot to sustain it. By contrast, Armand was a breath of fresh air. Oh sure, he’s straight out of central casting – the rakish younger son of nobility, irresponsible and smug, attracted to our guttersnipe heroine because she’s not like the boring society girls he knows. But he’s worlds more fun and interesting than Jesse, with not just a sense of humor but a sense that he actually cares about other people. He tried to sign up for the army, but his father pulled strings to keep him out of it; he loves his father and longs for his father’s love in return; he has friends. He’s a person, while Jesse is just something hot for Lora to long for. I don’t say all of this to be all Team Armand or whatever; y’all know I hate love triangles, and this book isn’t really one anyway. Despite Jesse’s gross statement that “He’ll feel compelled to try to claim you, and he won’t stop trying to do that,” there’s no real romance between Lora and Armand, and even Armand and Jesse gradually become allies, if not friends. All of which I actually rather appreciated because again: I hate love triangles. I’m just trying to contrast a character who sparkled versus a character who was a total dud. Finally – in large part due to the absence of a clear plot – there were a lot of plot elements that never really gelled. The World War I setting was unique and interesting, but it was almost never referenced – until the end, when it became abruptly super-important. Lora’s rivalries – and one budding friendship – with the other girls in her school don’t ever go anywhere in particular. At one point, Abe even throws down the most cliche boarding school rivalry trick in the book – one of the rich girls plants something stolen in Lora’s room in order to incriminate her – only to have Lora instantly find it and return it without a hitch, completely fizzling that story thread. Why even have it in there in the first place, then? Similarly, her almost-friendship with another girl – who at a late stage reveals a deep childhood friendship with and platonic affection for Armand – never goes anywhere. Why include it? Abe’s writing is compelling, in that straight-to-the-id paranormal teen lust way. Lora is a decent enough protagonist and Armand is genuinely enjoyable. But their story has no solid bones to support them, and the primary love story falls flat thanks to love at first sight with an unappealing hero. Two and a half cupcakes, and I think I’ll pass on the sequel. This entry was posted on Wednesday, September 11th, 2013 at 5:22 pm and is filed under 2.5 Cupcakes, Contemporary/Urban Fantasy, Other. You can follow any responses to this entry through the RSS 2.0 feed. You can leave a response, or trackback from your own site. Pooh! When I read the synopsis — girl gets sent away because of World War II PLUS boarding school book PLUS she’s a charity girl — I squealed out loud. Those are all three things I love, but I am too tired of paranormal romance to wade through one that’s just so-so.